DETROIT (Reuters) - Jack Kevorkian, a fiery assisted suicide advocate, will be released from a Michigan prison in June after serving eight years for murder and vowing never to help the terminally ill take their own lives again, state officials said on Wednesday. Known as "Dr. Death," Kevorkian, 78, touched off a firestorm of controversy in the 1990s for presiding as a medical doctor in dozens of suicides and advocating the legalization of such procedures in the United States. Kevorkian has been serving a 10- to 25-year sentence for second-degree murder for giving lethal injections to a man with Lou Gehrig's disease who died with Kevorkian's help in suburban Detroit in 1998. A representative of the Michigan Parole Board interviewed Kevorkian on Thursday. The state parole board then approved a recommendation Kevorkian be paroled in June, the earliest possible date for his release, officials said. Russ Marlan, a spokesman for Michigan's prison system, said Kevorkian acknowledged he had broken the law during a flamboyant eight-year campaign to legalize assisted suicide. "He said that anything that would bring him back to prison, he will avoid. He said prison is no place to live," Marlan said. Kevorkian will not be allowed to counsel anyone on suicide as a condition of parole, Marlan said, although he remains free to speak out on the issue of assisted suicides. Marlan said Kevorkian, who will serve a 24-month parole, indicated that he planned to write and speak on the question of assisted suicide once free. But Marlan added: "I think he sees his role in this issue as diminished." In 1997, Oregon became the first and only state to legalize physician-assisted suicide in the United States. Kevorkian, who claims he assisted in 130 deaths, had thwarted four attempts by prosecutors to convict him and flouted a state ban on assisted suicide that was passed in a bid to stop him. But in 1999 a Michigan jury convicted Kevorkian of second-degree murder after he videotaped himself administering lethal shots to 52-year-old Thomas Youk and sent the tape to the CBS news show "60 Minutes." In previous cases, Kevorkian had arranged to have those seeking to die under his supervision pull a string or otherwise start the process that led to their deaths from carbon dioxide or injected drugs. Kevorkian said he had hoped that the jury would acquit him of the 1998 case and set a legal precedent for assisted suicide in the United States. Michigan Gov. Jennifer Granholm had repeatedly refused to pardon Kevorkian or commute his sentence. Kevorkian's lawyer, Mayer Morganroth, petitioned four times for his client's early release, saying Kevorkian was unlikely to survive in prison because of his failing health. In June 1990, Kevorkian first attracted notoriety when the retired pathologist helped a 54-year-old woman suffering from Alzheimer's disease kill herself in the back of his rusty van. Although He meant well and he fought against the system whereas doctors both in Europe openly did what he did for years and in the United States as well, but it is unChristianlike to do such things. We must leave all those things to God as he is our creator. I wouldn't make assumptions as to someone else's religious affiliation. I was actually speaking about some Christian members on this Forum and about myself. Edited by Anahid Takouhi, 14 December 2006 - 11:19 AM. It's wonderful to read about this news. He doesn't deserve to be in jail. He's a great humanitarian who'll be remembered in history as such. anoushik jan; frankly when I read this I was happy for him too. Humanitarian?? That sounds too far fetched, but I agree that he didn't deserve that prison sentence. Better from one's own hand than from another's. Dr. Kevorkian has joined his "customers". ROYAL OAK, Mich. (AP) — A lawyer and friend of Jack Kevorkian says the assisted suicide advocate has died at a Detroit-area hospital at the age of 83. Mayer Morganroth tells The Associated Press that Kevorkian died Friday morning at William Beaumont Hospital in Royal Oak, where he had been hospitalized. Edited by Arpa, 03 June 2011 - 10:12 AM. His nickname "Dr. Death" should be changed to "Dr. Merciful". Dr. Jack Kevorkian, the Michigan physician who caused a storm of controversy with his advocacy for assisted suicide, has died. Kevorkian, who was known by the nickname "Dr. Death," died between 2 and 2:30 a.m. Friday morning, the Detroit Free Press reports. The 83-year-old had been hospitalized for about two weeks with kidney and heart troubles. His lawyer, Mayer Morganroth, told the newspaper that Kevorkian appeared to have died from pulmonary thrombosis. Morganroth and Kevorkian's niece Ava Janus were reportedly by his side when he died. Kevorkian, who grew up in Pontiac, Michigan, died at the Beaumont Hospital in Royal Oak, a suburb of Detroit. He first earned the nickname "Dr. Death" in the 1950s when he began advocating for prisoners on death row to become participants in painless medical experiments that would begin when they were conscious, but end in death. In 1986 he again courted controversy by mounting a campaign around the benefits of euthanasia. Kevorkian even invented a suicide machine he called the Thanatron, which delivered a dose of saline, followed by a painkiller and finally a lethal dose of potassium chloride poison. While neither the machine nor the concept was ever widely accepted by the medical community, Kevorkian eventually made headlines in the 1980s for his plan to set up a franchise of "obitoriums," where terminally ill patients could end their lives with the help of physicians. But the most sensational media attention came in 1990, when Kevorkian helped Janet Adkins, a 45-year-old Alzheimer's patient, to end her own life. Kevorkian assisted in her suicide inside his Volkswagen van in a public park, with Adkins dying of heart failure after Kevorkian administered a lethal dose of poison. Kevorkian soon became an international celebrity over the incident, but was also charged in Adkins' murder. However, the charges were later dismissed do to a lack of clarity on Michigan's assisted suicide laws. He continued helping terminal patients commit suicide, and his medical license was eventually suspended. However, Kevorkian continued his crusade despite laws that toughened various states' stance on assisted suicide. He was in court numerous times, was jailed on occasion, and was eventually convicted of second-degree murder in 1999. 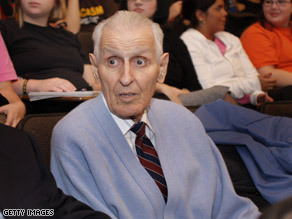 Kevorkian was sentenced to 25 years in prison, but was released in 2007 after serving just over eight years of his sentence. After his release Kevorkian continued his advocacy, joining the lecture circuit and speaking about his experiences with assisted suicide. We also remember when he was severely criticized for comparing the "holocaust" where the victims were "anasthetized" with gas, vs the Genocide where, among many murderous atrocities pregnant women's abdomens were bayonetted....just for "fun". Edited by Arpa, 03 June 2011 - 09:02 AM. Did Dr. Jack subscribe to any organized traditional church or was he an agnostic universalist? Observe that his funeral service was held a cemetery chapel with a generic service. I don’t see any Vardapets, Kahanas , neither do I see Evangelical pastors or Catholic priests. FILE - In this Dec. 3, 1990 file photo, Dr. Jack Kevorkian sits in his lawyer's office in Southfield, Mich., after Oakland County Prosecutor Richard Thompson announced that he would be charged with murder in the death of a woman who committed suicide by using a device of the doctor's. Kevorkian's lawyer and friend, Mayer Morganroth, says the assisted suicide advocate died Friday, June 3, 2011 at a Detroit-area hospital at the age of 83. A public memorial service for assisted suicide advocate Jack Kevorkian is planned Friday at a suburban Detroit cemetery. Kevorkian friend and lawyer Mayer Morganroth tells the Detroit Free Press the ceremony is being held at 9:30 a.m. at White Chapel Memorial Cemetery in Troy. Morganroth says there originally was no plan for a public memorial, but a worldwide response led to the scheduling of the event. The 83-year-old Kevorkian died last Friday at Royal Oak's Beaumont Hospital, where he was being treated for pneumonia and kidney problems. Kevorkian has said he attended about 130 deaths. He went to prison after a 1999 conviction for second-degree murder and was paroled in 2007.
heritage but has no family connection to the so-called "Dr. Death." "Everybody and their brother would always ask if we were related," she said. late doctor, with his permission, as "Uncle Jack." the internship without any say in the matter. "At the time, I didn't even know what a hospice was," Kristine said. "But I took to it like a fish to water." She knew right away it was what she wanted to do with the rest of her life. most courageous people in the world." patient, on camera, in a video broadcast on 60 Minutes. Wallace of 60 Minutes, who had become closely acquainted with Jack. voice on the other end. "It was really surreal," she said. told her not to worry. "He said, 'Don't ever apologize. You have so much passion,' " Kristine recalled. mandate, she said, to spread the word about end-of-life care. their families. She said that was Jack's goal as well. "In hospice, there is some control that people can have in dying,"
seen many examples of grief handled poorly. could we have done differently?'" since she first became involved in hospice work. received her doctorate in thanatology, the scientific study of death. including the famed spiritualist Ram Dass. the National Health Service's end-of-life care program. wants to bring her educational training to Tacoma Community College. aging, caregiving and other related issues, Kristine said. TCC has not yet responded to her proposal. looking over hundreds of submissions for classes. "They haven't said no to anyone," Jennison said. the control they can have." obtained his papers and is set to make them public for the first time. them understand his role in the right-to-die debate. medical histories, photographs, video and audio. of Michigan Medical School, a musician, composer and scientist,"
the library's director, Terrence McDonald, said in a statement. of consultations with patients, the AP said. "medicide" to describe physician-assisted suicide. Bentley's lead archivist who processed the materials. KEVORKIAN ARCHIVE: 'DR. DEATH' POSTHUMOUSLY REDEEMED AFTER 5 STATES LEGALIZE ASSISTED SUICIDE? October when the archives were opened at the University of Michigan. said The New York Times. He died in 2011 at age 83.
in a news release on the archives. spanning from 1911 to 2014.
terminally-ill patients from 1990 to 1998, according to the library.